A heavenly twist on a snickerdoodle cookie will have you coming back for more. Set the cookie dough on to a large piece of plastic wrap and form the dough into a fairly flat round. Wrap the dough completely in plastic wrap and chill it in the refrigerator for an hour. After the dough is done chilling in the refrigerator, preheat the oven to 350 degrees F.
In a small bowl, add sugar and cinnamon. Stir it until incorporated. Set aside while making the cookie dough balls. Roll 1-1/2 teaspoons of dough into a ball. Then flatten out the dough ball with the back side of a small spoon or the palm of your hand. 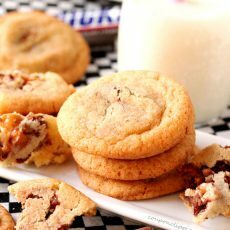 Set a Snickers baking bite in the middle of the flat piece of dough. Wrap the dough around the candy and form a ball that completely covers it. Coat the dough ball with the cinnamon and sugar mixture on all sides. Set the sugar and cinnamon-coated cookie dough balls on a large ungreased cookie sheet. Repeat the process with the remaining cookie dough. Bake in a preheated oven in batches. So that the cookie doesn't form a "mound" in the middle; after it bakes for 10 minutes, lightly press a spatula on top of each cookie to slightly flatten it. Then bake for another 4 minutes (total baking time is 13 to 14 minutes). Remove from the oven and transfer the cookies to a cooling rack. So that the cookie doesn't form a "mound" in the middle, after the cookie bakes for 10 minutes, lightly press a spatula on top of each cookie to slightly flatten it. Then bake for another 4 minutes (total baking time is 13 to 14 minutes). For a delicious and fun finger-food dessert, break the cookies into medium-size pieces to make a "Broken Cookie Party Mix". Serve in a bowl and garnish with the remaining Snickers bites.